Geeky dads love everything retro and these 8-bit DIY cards from crafty designer Kate Lilley, the blogger behind Minieco, have enough digitized simplicity in their two-dimensional pop-up design to send Dad on a trip back to the 80s. Keep reading to find out how to help your child make one. 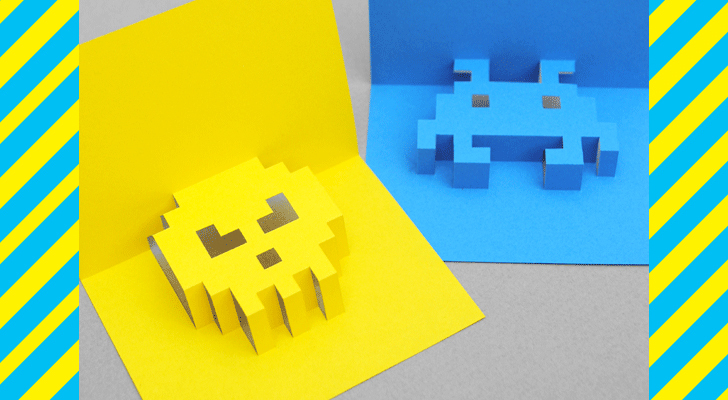 The 8-bit cards dreamed up by Minieco’s Kate Lilley are relatively easy to make (younger children will need help from an adult) and when multiple layers of colored paper are used, they can give the appearance of a lo-fi three-dimensional image. Dad will love that the images look like characters from the arcade games he used to play when he was a kid (and that some dads have yet to give up). The designs feature a heart, a skull and the iconic Space Invader. Dad will be so moved that he might grab a roll of quarters, pack the kids into the mini-van and set out in search of the closest arcade. 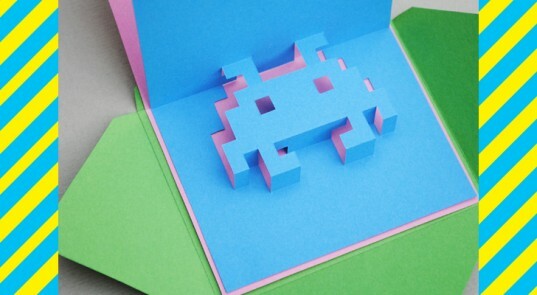 The 8-bit cards dreamed up by Minieco's Kate Lilley are relatively easy to make (younger children will need help from an adult) and when multiple layers of colored paper are used, they can give the appearance of a lo-fi three-dimensional image. After you make the card, have the kids write a note in one of these these super fun retro DIY cards. Say "Happy Fathers Day!" or something more random and surprising such as "Coin detected in pocket!" Beyond the Space Invader-like characters you can construct other shapes, like hearts, using the same method.